I first heard about the concept of intensive articulation therapy, or “speedy speech,” from a graduate school colleague. She and I were bemoaning the logistical nightmare of scheduling articulation clients in the public school setting. As graduate clinicians in our outplacement experiences, it was already becoming apparent that real-world SLPs in the public school setting have a really hard time scheduling all kiddos working on similar goals at the same time. What we saw happening was that articulation-only students were grouped with grade-level peers who were working on language goals. She and I discussed how silly this was, and how it goes against everything we learned in grad school (and common sense!) about the importance repetition, intensity, and specificity (Kleim & Jones, 2008). Clearly, it is unlikely that the lone articulation student in a language group meeting for 30 minutes once per week will get the repetition, intensity, and specificity necessary to produce progress. That’s when my colleague remembered hearing about a group of SLPs in one school district who went rogue... They did away with the traditional pull-out model for their artic-only students, and instead went from classroom to classroom to pull students into the hallway for 5 minutes of intensive individual drill, armed with only a deck of flashcards. While I am not a fan of “drill and kill” as a one-size-fits-all treatment model, this concept makes so much more sense to me for this particular population! Who were these SpeechPath pioneers? Are there more of them out there? What are their secrets? Although I’m sure this concept has been around forever, it seems as though Sue Sexton (creator of the 5-Minute Kids Program) was the first to publish about this kind of treatment approach. See Word Nerd Speech Teach for a nice review. There are a couple therapists, JoAnn Tuttle, SLP and Tamara Truax, TSHH who have created a Speedy Speech website and product line. I'm not sure where they're hiding their "evidence based practice," but their ideas and claims support the themes I'm seeing from other sources. See Speech Time Fun for a nice review of the Speedy Speech program. I was also able to find quite a few bloggers utilizing “Speedy Speech” - SLP-ity. You'll find similar ideas in the research literature, often referred to as “intensive articulation therapy,” or “drill burst." "There are no efficacy studies that have evaluated the claim that 2–3 times a week for 20–30 min in group settings outside of the classroom is an effective service delivery model (Brandel and Loeb, 2011, p. 475)" and YET it is the most frequently reported, with "little variability across disabilities and severity level (p. 471)." Speedy Speech – of 13 students with single sound disorders who received 5-7 minutes of service 3 times/week and a homework program, 15% met their goal in 8 weeks, 54% met their goal in 16 weeks. Only 3 students required additional intervention (Kuhn, 2006). An intensive articulation plan certainly covers (1) and (2), and my programming will accomplish (3). You know I'm all over (4) in lots of previous posts with my homework calendars! I'm still working on (5) and (6) ... We'll chat later about how I plan to meet those! So I've started implementing an intensive articulation therapy program at my school for four (soon to be five) of my articulation-only students. I'd like to expand to more students, but was faced with a few challenges. 1) I am brand new! I have hardly any clout with the parents and staff to go making big changes right now. 2) I am only able to schedule students for 4 days per week, due to having on meetings-only day. 3) Its new! For whatever reason, I've found that change is tough on everybody in schools. Luckily I discovered an ally early on in one of the special education teachers. She had actually brought up a similar idea the previous year as a way to get the kids to have a speech "warm-up" each day. As soon as they drop off their things in homeroom, I have my three little guys come to my room four mornings per week. Two of them have severe speech-sound disorders, while I would classify the other as moderate. For two of them, the speech quickies are replacing a once-weekly 30-minute session. So they come 8 minutes x 4 days. The other little boy stays double the time (15 minutes) to make up for a twice-weekly 30 minute session. Another student comes for 10 minutes at the end of each day. I called all of the parents before starting to fill them in on my ideas, and made IEP ammendments. I'm seeing immense progress so far, and the parent and teachers are loving it! Before each session, I'll grab picture cards for each sound we're targeting, and my speedy speech data sheet. 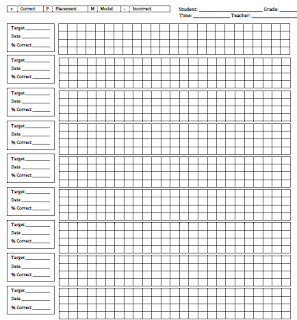 I created this data sheet in order to be a organized way to track progress - There are 4 rows of 25 boxes each to make counting easier. Even in my 8-minute sessions, I'm able to get at least 25 repetitions per student. 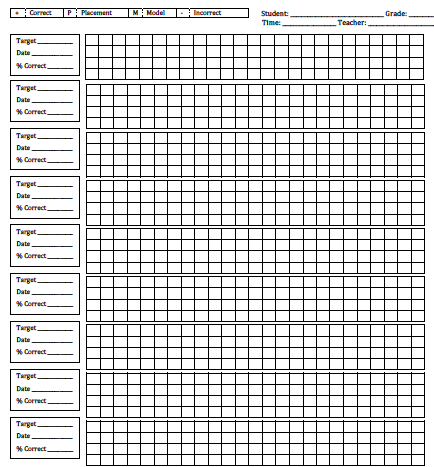 You can grab a copy of the data sheet I use here. Then I get our my reinforcement materials - I always plan for simple reinforcement but no real "game" in order to maximize our time. Typical activities include: moving pieces around a game board, collecting Hopping Frogs to put in the bucket at the end of the session, earning tokens to cover a board, tossing a ball with Velcro Mitts , drawing a picture of something starting with the target sound during breaks, or doing rainbow spelling words (with target sound) during breaks. Do you implement a similar program at your school? What are the keys to making it work? What are the obstacles to starting this type of program? After attending a seminar a couple of years ago, one of the SLPs in our system approached our supervisor. He thought it was a great idea, but couldn't figure out how to make the frequency of services work with the funding. So, I started having "5 minute days". The kids still come to my room for 30 minutes, but once a week I see each one for 5 minutes for "kill & drill" while the others are involved in "centers". I definitely think the kids are progressing faster, even with just doing it once/week. I really like your compromise! I may start this the next six weeks with one group and see how it goes. What do you use for your centers work in the "speech closet" room? Hi thanks for your thoughts! I was wondering if you could share the Montgomery (2006) article, I'm unable to find it and would like to use the evidence. The Montgomery, 2006 reference was to a poster presentation, not an article. Unfortunately I don't have a copy to share, but you might be able to hunt it down using the title "Vision and Values in SLP Intervention: Let’s Get Intensive!" Good luck!